Status update from Skyrim | Thapphireth! I bought Skyrim when it was hip and fresh just like you, but then life came between me and this awesome game. I haven’t played it for real since January and I don’t plan to touch it for a good while because it screwed things up pretty royally for me at the university. And I’m still paying for my folly… Still, I used to love this game just like you did, so here’s some screenshots of my character. Marcus hasn’t been the same since January when I left him in Solitude, overencumbered and with that racist Belrand for company. Home: Breezehome. It’s pretty messy and there’s tons of stuff there so I’m probably what you might call a hoarder. But it isn’t my fault that none of the merchants have enough money to buy all my stuff. Spouse: Lydia. I feel pretty bad about this. Really. I had to use the console to get her to marry Marcus, which isn’t cool. But he still misses her. This college for bards isn’t his style and the people are still crazy obsessed with an execution that took place like forever ago. Plus, the Queen always says inappropriate stuff and tries to touch Marcus where he doesn’t want to be touched. And Belrand is driving him nuts with the smell of his greasy, unwashed hair! Most used follower: Lydia. One of the reasons I married her was so she would be invincible. 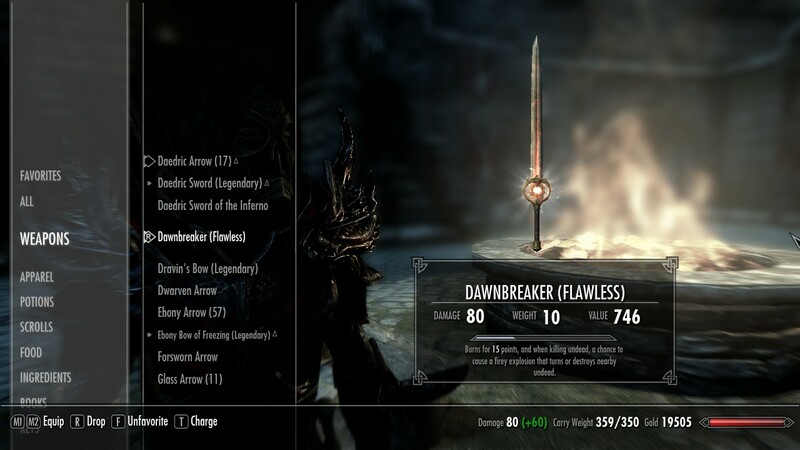 Favorite Weapon: Dawnbreaker. 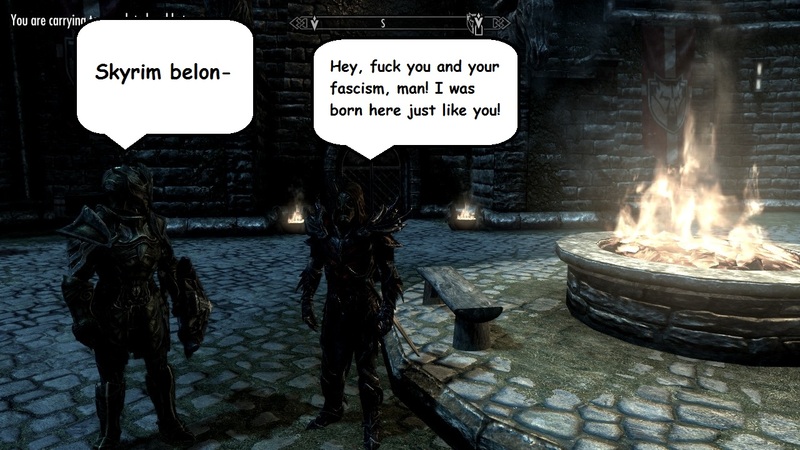 I used to despise the Daedra, but then I realized that they had cooler weapons than the good guys. Plus, there’s no way to join the Vigilants of Stendarr or what they’re called. 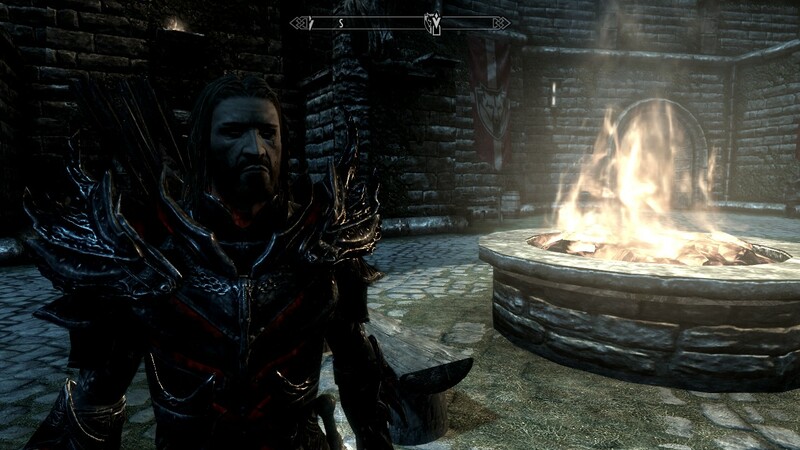 A troubling thing is that Marcus has been recently walking around in Solitude with a drawn sword, and I think it’s just a matter of time before he snaps and kills every single killable NPC in the town. Starting with Belrand. Behold the weapon I use for breaking dawn! Try spending half a year with a bigoted racist who never washes his hair and you wouldn’t be so happy either. So Marcus is what you might call a Battlemage. Heavy armor, wicked blade, fiery balls. Cool stuff. Chance that I will get the DLC: Oh please. I haven’t even finished the main quest yet. And I still need to play the entire expansion for Oblivion. Plus, I haven’t finished Dragon Age 2 (which I started playing when it was released), and I haven’t downloaded that DLC with Felicia Day yet. Plus, I’ve heard rumors that Mass Effect 3 has been released already. And Diablo 3 apparently. But first things first. Marcus needs to empty his backpack so he can get the hell away from Solitude. And Belrand. « A fusion of Steampunk and Microbiology… Micropunk?